Polyvinyl alcohol (PVOH) is a water-soluble polymer, sold in both fully and partially hydrolyzed forms. Its properties vary depending on molecular weight (degree of polymerization) and fraction of acetate groups that are removed (degree of hydrolysis). PVOH is used in diverse applications, including textiles for warp sizing, adhesives, polymerization aids, pigment binders for paper, and other such applications where PVOH is used “as is.” Another major application involves converting PVOH to polyvinyl butyral (PVB), which is used as a coating to generate laminated safety glass for automotive and architectural applications. Global consumption of PVOH is forecast to grow at a moderate rate of 1.8% from 2017 to 2022. Global demand is dominated by China, which accounted for 42% of the total demand in 2017. The end-use distribution for PVOH varies among the regions. Polymerization aids is the largest end use for PVOH in China and PVB in the United States. Other Northeast Asian countries such as Japan will have much lower growth in demand compared with China in 2017–22. Western Europe, China, Japan, and the United States continue to be the largest PVOH producing and consuming countries worldwide. The high production levels in Japan and the United States are supported by large exports. With the largest demand for PVOH in various end uses, Northeast Asia represented 77% of the installed global capacity in 2017. 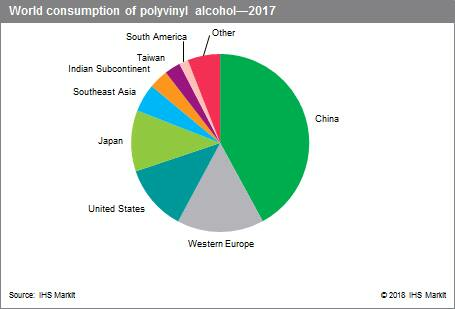 Polyvinyl butyral is the largest market for PVOH in the United States and Western Europe. PVOH usage as a polymerization aid is the largest market in China, while its use for fibers and optical-grade PVOH films dominates demand in Japan. Global PVOH consumption is expected to increase at an overall rate of about 1.8% annually between 2017 and 2022. In China, the major markets for PVOH besides use as a polymerization aid are for textile sizing agents, architectural, fibers, paper coatings, and adhesives. Demand is forecast to grow at an average annual rate of 1.9% from 2017 to 2022. China’s demand for PVOH is forecast to slow in comparison with the growth rate observed in the last five years, although PVOH in the fiber market is growing steadily. In Western Europe, demand growth for PVOH will depend primarily on demand for PVB resin, which is one of the largest and fastest-growing markets for PVOH in the region. The other traditional markets are expected to recover and increase, and new applications such as ceramic binders and water-soluble and biodegradable thermoplastic polymers could result in higher growth rates than forecast. Overall consumption of PVOH-based textile sizing agents will decline. Demand is forecast to grow at an average annual rate of 1.0% from 2017 to 2022, slower than the 3.2% in 2012–17. In the United States, most of the applications for PVOH are mature. The largest market is use in the production of PVB. Growth for this application is forecast at 0.5% annually during 2017–22. Overall consumption of PVOH-based textile sizing agents will continue to decline. US demand for PVOH in paper coatings will remain stagnant in the next five years. Growth in the adhesives market is forecast to be limited over the next five years. Overall demand growth in the United States is projected to be 0.4% per year from 2017 to 2022—much slower than the growth rate of 4.1% from 2012 to 2017. In Japan, total consumption of PVOH is expected to increase at an average annual rate of 1.0% during 2017–22, an improvement over the 0.3% growth rate in 2012–17.